Cappuccino and latte both decently done, definitely up to cafe standards. 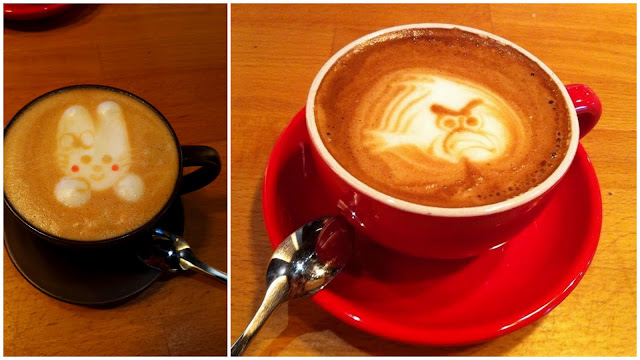 Their coffee art is by far the most interesting, and they don’t lost their form as you drink. An adorable bunny for me and angry birds for the friend. Chocolate truffle cake was pretty average, the old school type with more chocolate fudge than usual. 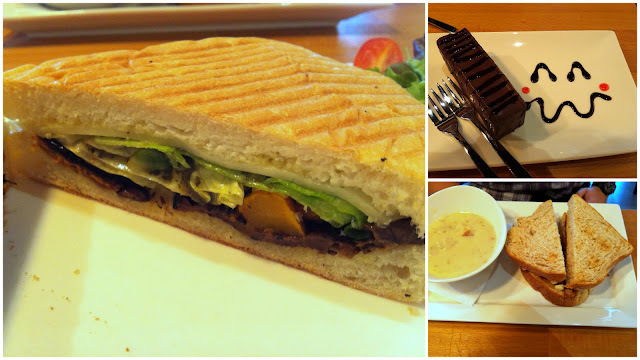 Sandwiches were hearty, something that I would head back for. My roasted pumpkin sandwich came as a turkish pide stuffed with the veggie goodness roasted with herbs like rosemary. The friend’s ham and cheese sandwich was huge because they used thick toast- the thickness of three gardenia pieces! All in all a satisfying lunch. Worth a trip down.